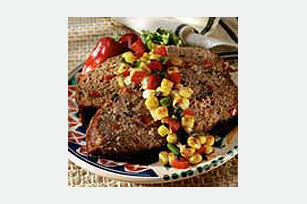 If you're in the mood to try a different kind of meatloaf . . . Try this one, with bold and spicy steak sauce, whole kernel corn and chopped black olives. Mix meat, bread crumbs, 1/2 cup steak sauce, eggs and half each of the peppers and olives until blended. Shape into loaf in foil-lined 13x9-inch pan. Bake 1 hour and 10 min. or until done (160°F). Let stand 10 min. Meanwhile, mix corn, onions and remaining steak sauce, peppers and olives until blended. Serve spooned over meatloaf. To thaw frozen ground beef safely, keep meat wrapped and thaw on a plate on the bottom shelf of refrigerator. Never thaw meat at room temperature.